After three straight non-conference games, No. 12 UCF shifts back to AAC play this Saturday as it hosts SMU at Spectrum Stadium. Coach Josh Heupel said preparation doesn’t change for the Knights (4-0, 1-0 AAC) as they enter the rest of their conference schedule, but there will be a difference in the matchups themselves. The Knights haven’t had too many close calls during their current 17-game winning streak, but the Mustangs (2-3, 1-0 AAC) gave them one last November. 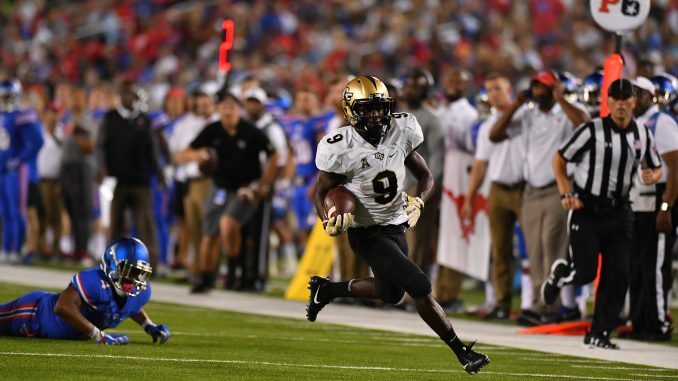 SMU kept the game as close as 28-24 in the fourth quarter, but UCF ultimately escaped with a 31-24 victory. The Mustangs ended up finishing the regular season 7-5, going just 1-3 in November. They lost their coach, Chad Morris, to Arkansas before the bowl game. New coach Sonny Dykes coached the team in its 51-10 Frisco Bowl loss before being tasked with moving forward without the team’s top two receivers, Courtland Sutton and Trey Quinn. The two NFL talents were instrumental in the success of then-sophomore quarterback Ben Hicks, who began this season as the starting signal-caller. He has since been replaced by freshman William Brown. In three games, Brown has completed 44 of his 66 passes for 541 yards and six touchdowns to one interception. James Proche has been the top target for SMU quarterbacks this year, catching 31 passes for 426 yards and five touchdowns. In the run game, Braeden West has averaged 5.3 yards per carry and scored four times. As a whole, the offense is averaging 29.8 points per game. Defensively, the Mustangs are allowing 38 points per game. Allowing 46, 42 and 45 points to North Texas, then-No. 16 TCU and then-No. 19 Michigan has skewed that number, as the unit has recovered a bit to hold opponents to 30 and 27 points in its last two games. The numbers as a whole aren’t anything special, but Heupel said the group could give the Knights a challenge. With the No. 7 scoring offense (48.8 points per game) and No. 15 scoring defense (16.8 points per game), UCF is one of two teams in the nation that are in the top 15 in both categories. The only other team is top-ranked Alabama. Over the last two years, the Knights have consistently fielded one of the country’s top offenses. The unit is No. 3 in total offense (582.8 yards per game), No. 19 in passing offense (310 yards per game) and No. 5 in rushing offense (272.8 yards per game). Despite the high marks through four games, junior quarterback McKenzie Milton said Monday that the offense still hasn’t reached its full potential. After Saturday’s game, the Knights won’t play at Spectrum Stadium again until Nov. 1. With that in mind, the team is looking forward to feeding off the home-field advantage for the last of four straight home games.